Peter Ryder: St John's Church, Stanwick, North Yorkshire: The Medieval Cross Slabs. Stanwick. 6km north of Scots Corner in North Yorkshire is best known for its Iron Age earthworks complex, at the centre of which St John's parish church now stands alone, except for the 17th century house of Kirkbridge. The church is now in the care of the Churches Conservation Trust; apart from its fine west tower, south aisle and south porch, it was heavily rebuilt in 1868 by Anthony Salvin. The building does however retain one of the most important collections of carved stones and monumental remains in North Yorkshire. In addition to many pieces of pre-Conquest sculpture, four very weathered medieval effigies, two brass inscriptions and the 17th century Smithson monuments, there is a very rich extensive collection of medieval cross grave covers. This latter, probably the largest group of such monuments in North Yorkshire, has never been described in print. Brian and Moira Gittos: The Ingleby Arncliffe Group of Effigies: A Mid Fourteenth Century Workshop in North Yorkshire. 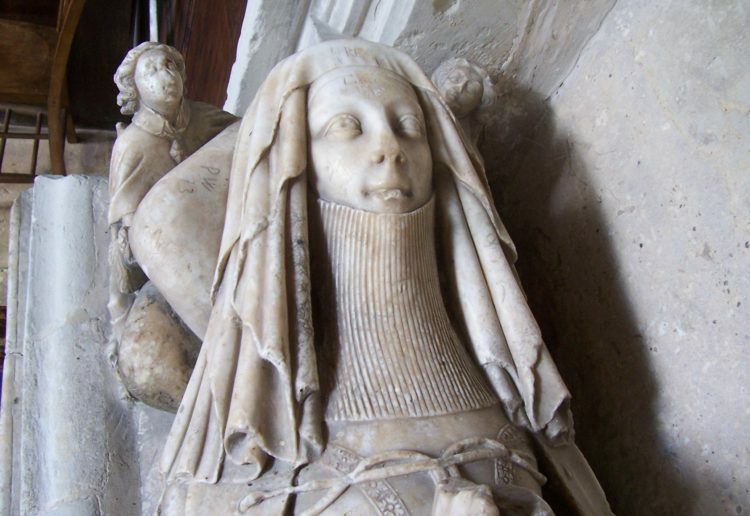 This study examines a tightly-knit group of mid-fourteenth century effigies located in the former North Riding of Yorkshire. Recognition of the output from this local workshop provides a valuable insight into the choices available to patrons, and the monuments also demonstrate that differing forms were produced by the same source. Previously published dates range widely but it is now possible to demonstrate the group were produced over a short span of time. The extremely poor condition of some of the figures tends to obscure the original intent and achievement of the carvers but careful examination enables a much clearer picture to emerge, with some unusual features present. The overall impression is of a competent, local supplier exploiting an expanding and developing market by catering for the precise wishes of his clients. Full details of each figure are contained in the appended catalogue. Claud Blair and John Goodall: An Effigy at Wilsthorpe: A Correction to Pevsner's Lincoln. Nikolaus Pevsner is frequently criticized for inaccuracies in his 'Buildings of England' series. Though the criticism is not unjustified, it nature has often seemed to me to be unfair in the light of the quite extraordinary personal achievement the series represents, and the important role it has played in the struggle to protect the nation's ancient buildings. The following correction of one of the inaccuracies is therefore to be regarded as no more than that. Mark Downing and Richard Knowles: A Fifteenth Century Helmet Depiction at Gnosall, Staffordshire. It is perhaps surprising to discover an apparently unpublished but significant feature on a medieval monument. Here at Gnosall is just such an example. Philip Whittemore: Monumental Brasses Formerly in the Church of St Leonard, Shoreditch. British Library Lansdowne Manuscript 874 is one of the most important heraldic collections to survive from the 16th century, but curiously enough, although well known, surprisingly little has been published concerning its content. 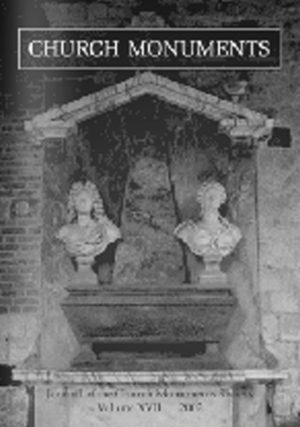 It contains an unrivalled source, not only of drawings of monumental brasses, but also sepulchral monuments and stained glass, much of which has since disappeared. The manuscript lists 27 London churches, not all of which are recorded as having monuments. Nicholas Charles, who visited the majority of the churches, does not specify exactly what type of monument he is recording, but from the tenor of the inscriptions, the appear to be, in most cases, brasses. It is a matter of great regret that none of the London monuments in the manuscript are illustrated. This paper looks at one entry, that for St Leonard, Shoreditch and its collection of brasses. Teresa Grant: 'Devotional Meditation': The Painted Ceiling at Skelmorlie Aisle. Jean Wilson: Dead Fruit: The Commemoration of Still-Born and Unbaptized Children in Early Modern England. John Lord: A Decade of Bertie Memorials in Lincolnshire. Charles Smith: The Memorial Stone Tomorrow: A Personal View. The following article reflects the author's personal comments to the Society's 2001 Symposium. The editors feel that it makes an apt inclusion as a commencement for further reflection and discussion. In view of that I have included some illustrations of his craftsmanship in gravestone cutting. Norman Hammond: Church Monuments in Belize: A Final Note.